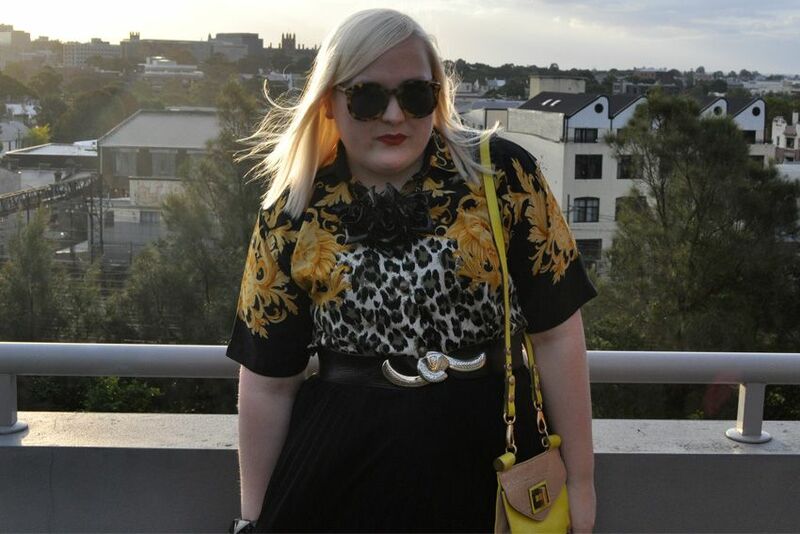 I was invited by Mimco along with 19 other bloggers to sit front row at their LMFF runway show showcasing their AW2012 Dreamwarp collection. 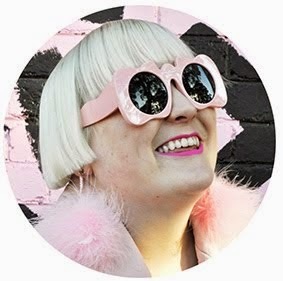 Mimco is an iconic Australian fashion success story, growing from Amanda Briskin's initial $5000 and idea of creating great accessories in 1996 to over 50 stand alone boutiques in Australia and the world today. On trend accessories with a vintage feel and a modern twist are synonymous with the brand Mimco, from the iconic button bag to the hair accessories I lusted after as a teen Mimco has been creating must have pieces since they began. This new collection was no exception, Mimco showed the oversized statement jewellery that they are known for along with their collection of bags, purses, shoes, hats and umbrella's. The styling of the runway made use of every available space for a chance to showcase the range, with models carrying as many bags as they could carry (or wear as fanny packs). The classic Mimco button bag has been updated this season. This is where I got arty, changing the settings on my slr to try and best capture the mood lighting of the show. The gold in the bag really shines, as does the red umbrella. My rooftop at sunset is my new favourite place for moody outfit photos, I mean look at that light! Once back in Sydney I decided to recreate what I wore to the Mimco show and The Age photoshoot to best capture the cute bag that Mimco gave me (and yes if you click over to the photoshoot you won't be able to see me as I was sitting right behind the dude who stuck his head way out, yay go me, but I am quoted in the article by The Age's Fashion Editor Janice Breen Burns at least). Someone in our building is growing these awesome sunflowers in our communal garden which I thought would make a great backdrop to my yellow accessory party. We got to choose a piece from the Mimco collection and as soon as I saw this yellow neon bag I knew it was the piece for me, I love its art deco almost oriental feel and tortoise shell encased clasp. 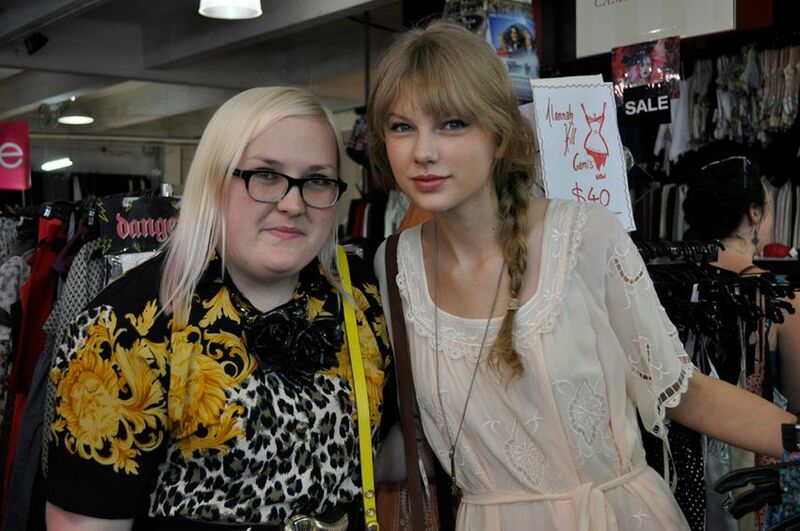 Bonus photo of me and Taylor Swift who I bumped into whilst shopping in Fitzroy with my interstate blogger bud Phebe on the day of the Mimco show. Love tha shirt, and adore the skirt. I am doing a black necklace DIY inspired in yours. See what comes out, lol. and how much of a babe is taylor swift, actually?! I love the jewellery Mimco produces, especially their collar necklaces.. so beautiful, sadly, at this stage, there's no way I could justify spending so much on jewellery. 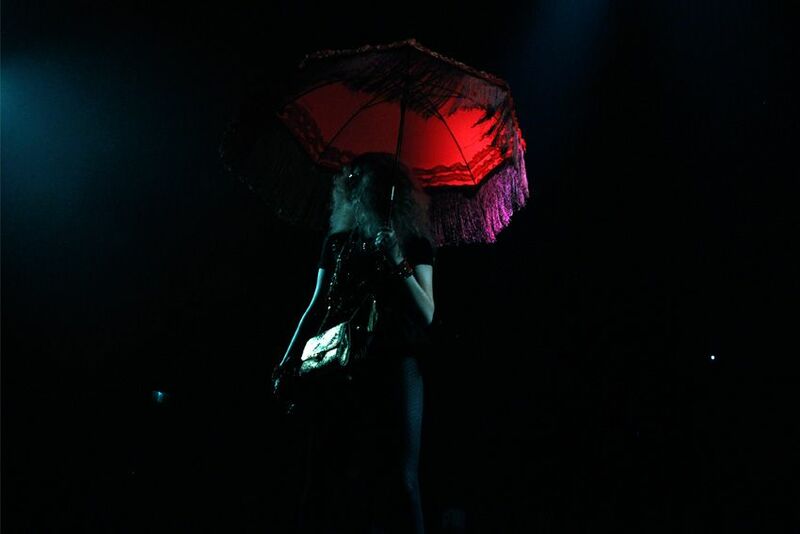 I love the umbrellas in your show and I love your outfit. Oh, that red lipstick you wear is amazing too. I don't really like Taylor Swift's music, I won't deny, that she looks really good though! I like her eye make up. That looks so amazing and your outfit is seriously to die for! Just beautiful. omg you ran into Taylor Swift! Possibly the coolest thing ever! I went to her concert when she played in Sydney - amazing & inspiring. So jealous you met Taylor Swift and got to sit in the front row at the Mimco show! 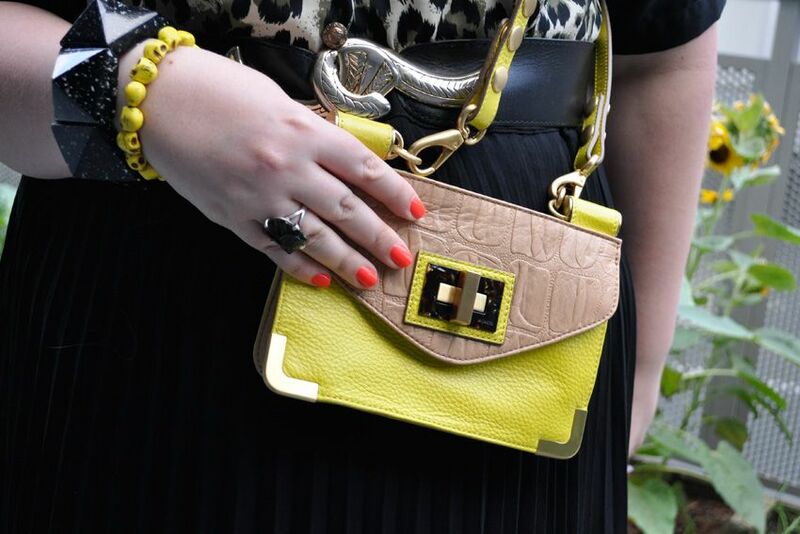 Acid Yellow Mimco meets Vintage Versace (i'm guessing...correct me if i'm wrong) looks AH-HHHMAZING!!!!!!!! 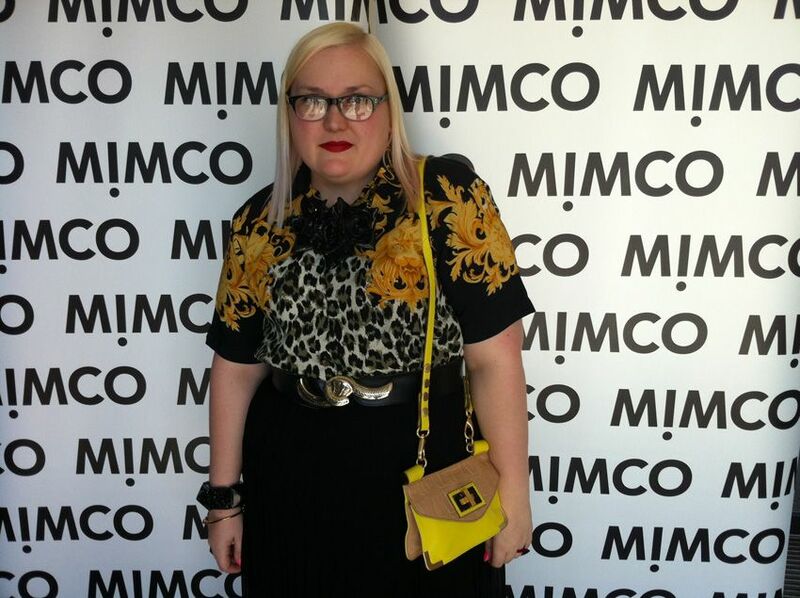 Mimco look to have produced yet another fab collection. Thanks for sharing it! Tribal Inspired Neckpieces and Bold Bangles In Stock NOW! Wow, Taylor Swift. That's some amazing stuff!